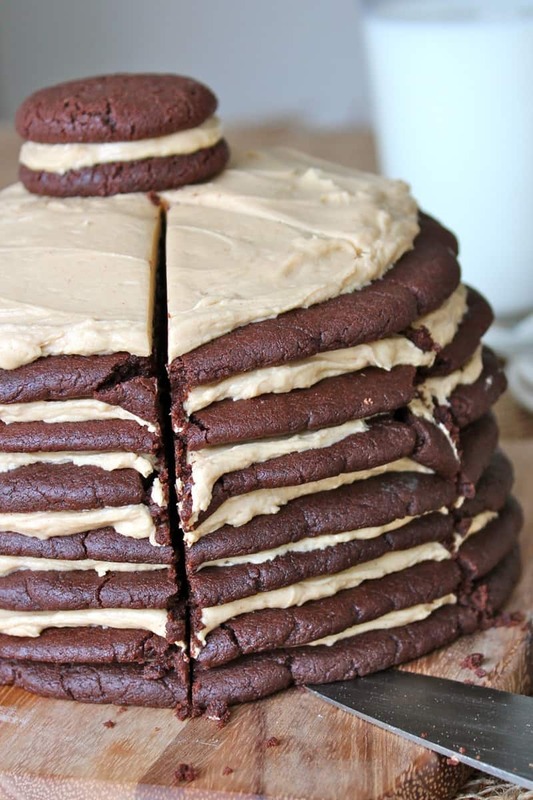 Layer after layer of chewy fudgy chocolate cookies with the most addicting peanut butter filling holding them all together! It’s a real treat! Today is my 1st birthday! Okay, not really me as in Maegan, but me as in The BakerMama! It’s The BakerMama’s 1st blog birthday or blogiversary as some might call it! I think I’ll stick with blog birthday since The BakerMama is young and most one year olds don’t celebrate anniversaries, they celebrate birthdays! So Happy Blog Birthday, BakerMama! Let’s celebrate! With cake, of course! I really can’t believe The BakerMama blog went live a year ago today! Time sure flies when you’re having fun! What a tasty first year it’s been and I’ve loved every single bite! Baking is my passion and I feel so privileged to be able to share my favorite recipes with you! It’s been a busy year of baking goodies and baking babies, and I can’t imagine life any other way! I still love the first recipe I posted just as much as I love this recipe I’m sharing with you today. No surprise, they both have chocolate and peanut butter in them! You can’t go wrong with that combo now can you?! 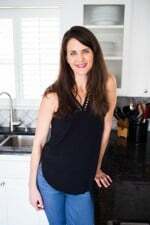 I create recipes with the hope that you will bake them for yourself and your loved ones and get as much joy out of them as I do with my family and friends. I strive to keep my recipes simple, usually sweet, sometimes savory, and especially delicious! So thank you for your love and support this past year! I’m flattered you’re following me and baking with me! I get really excited every time I post a recipe knowing that it could become a family favorite in your home for years to come! 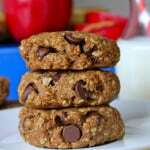 And it makes me so so happy when I hear that you have tried a recipe and loved it! That’s what it’s all about, my friends! It sure was a scrumptious year and it’s just gonna get tastier so stay tuned and stay in touch! To celebrate The BakerMama (okay, me! ), I baked her (okay, me!) a cake! No birthday is complete without cake and this is not your average birthday cake. 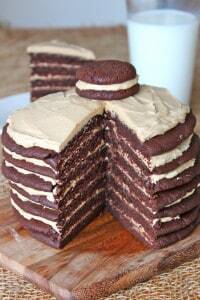 It’s a layer cake, but those layers are not cake, they’re COOKIES!!! Get excited, my friends! Layer after layer of chewy fudgy chocolate cookies with the most addicting peanut butter filling holding them all together! I’m head over heels in love with this cake! It’s absolute perfection to my eyes, ears and mouth! I love peanut butter, I love chocolate, I love cookies, and I love cake! So I put all my love into it and it’s incredible! 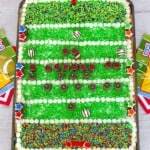 So join me in celebrating because The BakerMama blog wouldn’t be here without you! As I eat every last bite of this delicious cake, I’ll be thinking of you and also thanking you for making this possible! Here’s to many many more years of tasty treats and wonderful memories! Let’s eat a cake that’s made of cookies! Ready to bake some BIG cookies?! This recipe was created as part of my partnership with Gold Medal Flour however thoughts and opinions are certainly my own! Layer after layer of chewy fudgy chocolate cookies with the most addicting peanut butter filling holding them all together! It's a real treat! Preheat oven to 350°F. Line two large baking sheet with parchment paper and set aside. 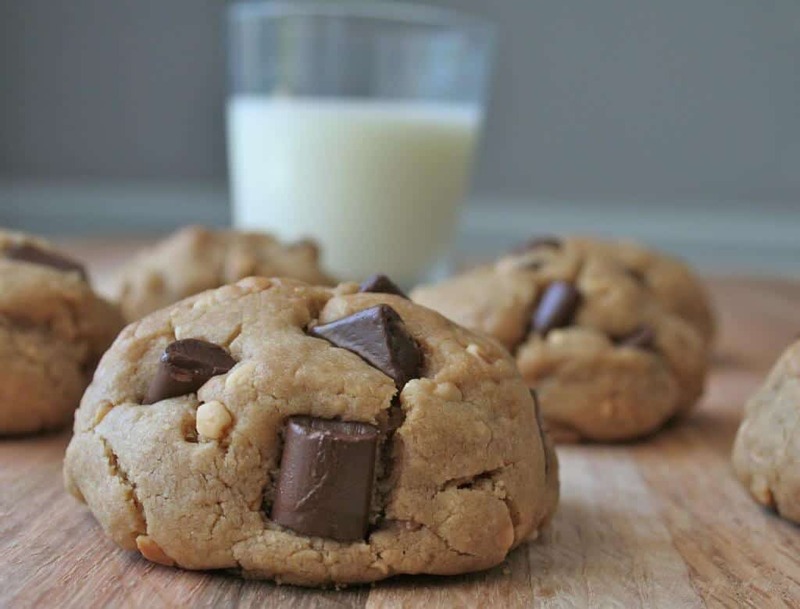 In a large microwavable bowl, melt the butter and chocolate chips, stirring every 30 seconds, until melted and smooth. Let cool slightly. Whisk in the sugar then the eggs and vanilla until well combined. In a medium bowl, whisk together the flour, cocoa, baking soda and salt. Add to the chocolate mixture, stirring until well combined. 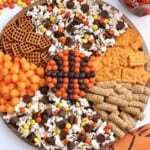 Form ½ cup portions of dough into 7 balls and flatten into 6-inch round discs on prepared baking sheets. Form remaining dough into mini balls and flatten to bake and use for garnishing or just to munch on. Bake dough for approximately 8 minutes until edges are just starting to crisp and middles are still chewy. Let cool completely on cookie sheets. Meanwhile make the filling. In the bowl of an electric mixer fitted with the wire whip attachment, beat the butter and peanut butter until smooth. Add the powdered sugar and beat on high speed until fluffy, about 3 minutes. 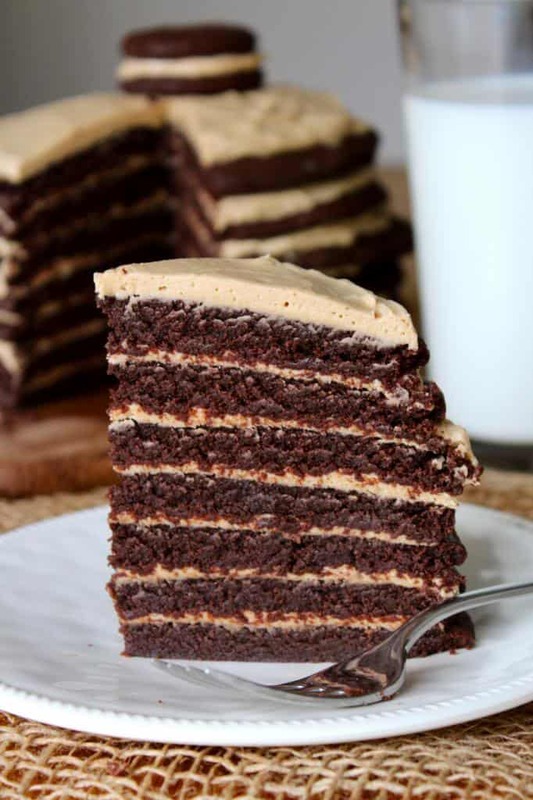 Use a large spatula to transfer a cookie to your cake stand or serving dish and spread the top of it with a few tablespoons of peanut butter filling. 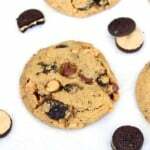 Keep layering cookies and filling until the cookies are all stacked. 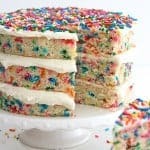 Top the cake with a thin layer of frosting and a few of the mini cookies.